General Admission Show; limited seating – First-come, first-served. This tour is focused on vacation spots with natural water features like beaches, lakes, rivers, bays and of course the ocean. Along with catching a show in the evening, you can join me in the daytime for some activities that combine having fun outdoors with environmental stewardship. For example, we can clean up a beach and then jump in the water to catch some waves or paddle around. I had a blast on the Lift Series tour and can't wait to see what the East Coast has in store for us this summer. The red-haired, California-based singer-songwriter Brett Dennen has come a long way since 2005, when he gave shy, barefoot solo performances around the release of his first album. Now on his sixth, Por Favor, this folk-pop singer/songwriter and self-proclaimed “Wild Child” has taken the music scene by storm. 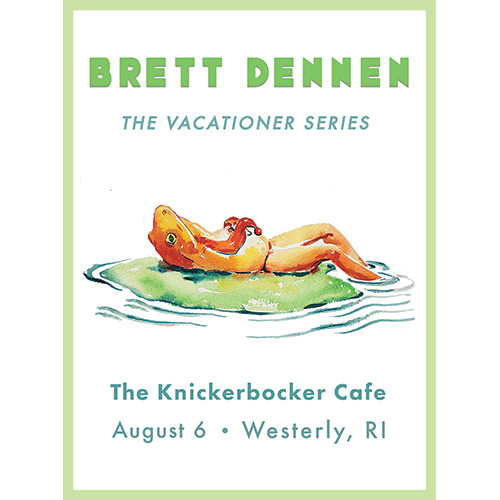 With a knack for hooky melodies and joyful lyrics, Dennen has made a name for himself, and is “capable of cranking out big, beautiful pop songs…capturing both the ornate and the simple” (NPR). He creates “nimble grooves, creamy choruses, and vocal performances of immediacy and genuine feeling…carefree soulfulness that recalls Van Morrisson” (Paste Magazine). Dennen is also a social activist striving for equality and peace – topics which find their way into his song lyrics along with themes of vulnerability and forgiveness. In his live performances, Will uses his impressive looping skills to combine his drumming background with his highly energized and entertaining acoustic style. With his powerful new line-up of Multi-Instrumentalists Will Evans and Rising Tide are poised to climb back to the top of the Northeast Roots music scene. Will has shared the stage with many top artists including Crosby and Nash, Grace Potter, Bruce Hornsby, Rusted Root, Trevor Hall, Donavon Frankenreiter, Railroad Earth and members of Dispatch to name a few.